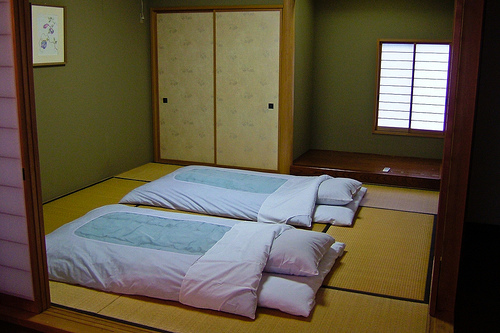 Which Bedding the Japanese Use Futon or Bed? The result of “What Types of Bedding Do You Use?” poll taken by goo was opened, and futon topped the list over beds. After the result opening, a thread titled “Wake up bed maniacs! Bed never surpasses futon” was newly posted in 2channel, and bed-futon discussion broke out. Futon people’s point is that they can use a room spaciously by putting futon away during a day. In Japan, futon is folded up and put away in oshiire closet when it is not used. So the room can be used for different purposes. Households that have young children tend to have futon so that parents and children can sleep together in a row. Bed people say bed is healthier and less troublesome to make. Although futon won the first place in the poll, bed won over futon on ratio basis. The beds votes were subdivided by size; single bed ranked second and semi double and double beds followed. Total percentage of beds was 55 and that of futon was 45. Year-End Giveaway Campaign Part 1!